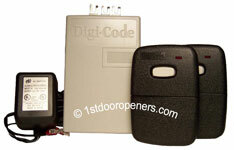 Below you will find the most common Stanley and Stanley SecureCode replacement receivers with remote controls we carry. If you are not sure which is your replacement remote you may check your model number (you will need to have the model # off of the door opener motor in the garage) with our compatibility chart. 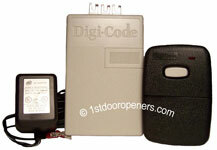 You can also use this link if you need coding instructions for your Stanley SecureCode opener. 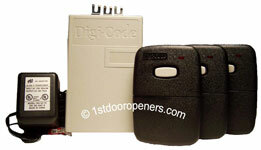 This page displays garage door opener receivers, 5102-1 universal radio control kit with 1 remote control, 5102-2 universal radio control kit with 2 remote controls, 5102-3 universal radio control kit with 3 remote controls, 5102 garage door opener 24V radio control, 5112 gate opener 12V radio control, and 5192-07 garage door opener 24V transformer that are on sale, in stock, and ready to ship. To aid in your purchase of products, please Contact Us. 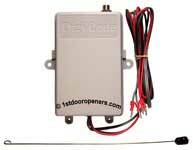 Gate Opener 12 Volt or 24 Volt Commercial Receiver. Dual frequency 300 MHZ or 310 MHz. Works with Stanley 310MHz or Multi-Code 300 MHz transmitters. Dip switch formats. Whip antenna and instructions included.